To a bald man, a comb is a comb is a comb. 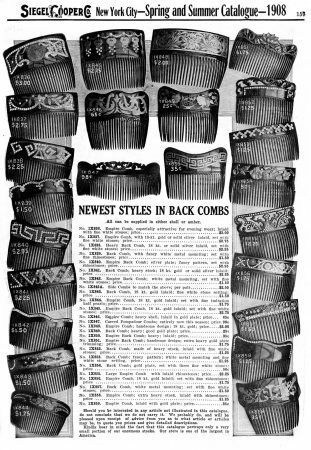 But not to a lady of 1908, a time when hair was piled high and finding the right “back comb” to add to it was an important choice. What a stylish layout Siegel Cooper presented! It’s one of two pages featuring nothing but combs, and even these are “only a very small portion of our enormous stocks” according to a note at the bottom. Available in shell or amber, the combs are priced from a modest 25 cents up to $3 – a luxury price indeed, as it works out to around $75 dollars in today’s money. Oddly, it’s very difficult to tell from the descriptions what makes one worth 65 cents and another one worth $2.75. 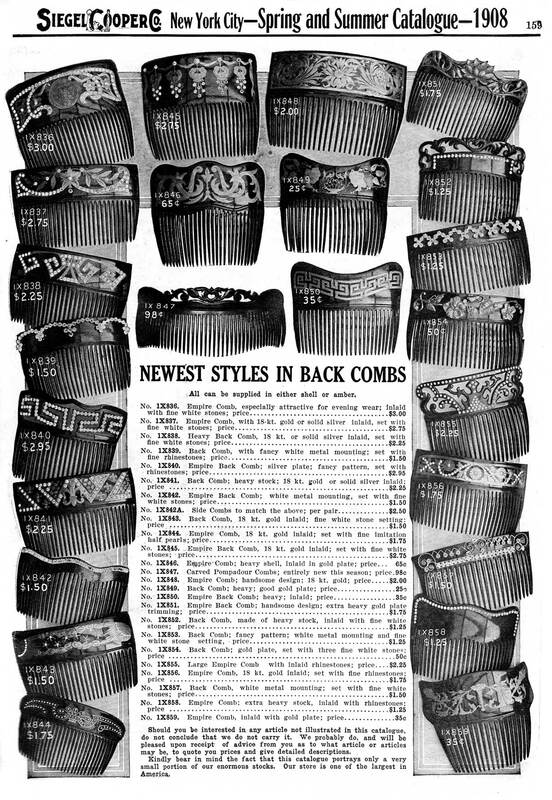 The top-priced comb is merely “inlaid with fine white stones” and “especially attractive for evening wear while the cheap model has “good gold plate.” Which makes even the cheapest one nicer than the budget models at Walmart.